Fully automatic Cap Tightening / Retorqueing Machine requires only 38" of line space. Ideal for Pump & Trigger Cap Tightening and Retourquing after heat induction sealing. 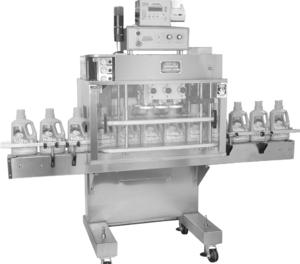 Portability allows versatility for automatic capping; easily moved from one production line to another. Handles metal, glass, or plastic containers from low jars and vials up to 2-1/2 gallons. Heavy duty patented multiple disc adjustable torque clutches which will give a consistent torque and minimize wear on cap tightening discs (three pairs).